Monetize Pop Unders, Redirects, RON, Parked Domains, International Traffic, & More! 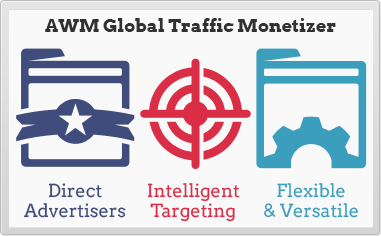 AdWork Media's Global Traffic Monetizer platform allows you to efficiently monetize your international traffic! Make money from your pop under, pop up, & exit traffic, RON & redirect traffic, parked domain traffic, interstitial traffic, mobile traffic, error page traffic, international traffic, & any other quality sources! Our system automatically optimizes ads for your traffic based on the user's device, country, and other factors to improve the user experience and ensure high conversion rates. Integration is fast & easy! Maximize your Earnings with Support for over 250 Countries! Our direct relationships with thousands of advertisers allows AdWork Media to offer the best payout and performance for your traffic. We intelligently target ads to your traffic and continuously optimize our ad inventory for the best results. Connect to our API feeds or postback tracking services to receive real-time conversion notices including conversion details such as the IP address, country, rate, etc. You can also pass tracking variables such as user IDs and placement sources. Get creative with how you generate traffic! Our system can work with nearly any traffic source and can be applied to monetizing parked domains, monetizing exit traffic, monetizing redirect traffic, monetizing mobile traffic, & many other sources! What Traffic Sources Work Best with the Global Traffic Monetizer Tool? Can I Monetize Parked Domains? Yes! You can monetize parked domains by directly forwarding traffic from your parked domains to a unique tracking URL generated from our Global Monetizer Tool. Generate revenue from users participating in ads on the optimized landing pages we target to your traffic! Please submit a Publisher application and we'll get your account processed within 1 business day. Once your account is approved you will have full access to our Publisher tools. If you need any help integrating your Global Traffic Monetizer after signing up please feel free to contact our support team and we will be happy to assist you.